This week we looked at the philosophy of Plato as it relates to our study of government, and ultimately I want the students to relate what we examine with Plato and Aristotle to their understanding of our own constitutional convention activity that we will begin next week. Plato and Aristotle in some ways, represent two different approaches to government. Plato (on the left) stressed the eternal, and spirit as opposed to matter. 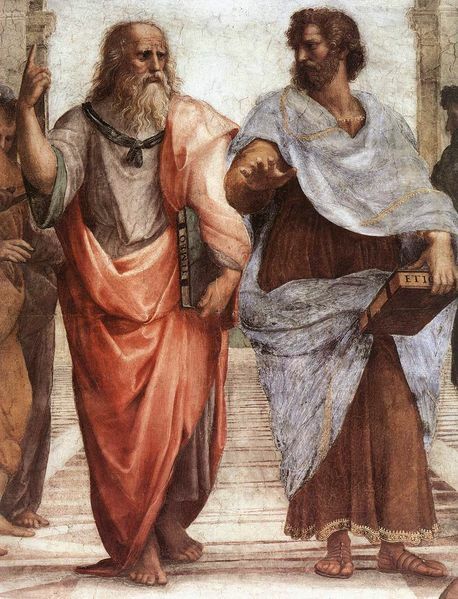 Aristotle (on the right) focused on the observable, experience, and “nature” as a fixed point. As for Plato. . .
For Plato, truth is not to be found in our experience in creation. Creation itself is at best a mistake, at worst an evil act. Creation is the “Fall” for Plato. Truth, therefore, resides “up there” in the world of perfect form and function, the world of ultimate truth and beauty. This truth is fixed, eternal, and unchanging. Plato believed that most people were guided primarily not by their intellect, but by their appetites. We should not restrict this idea of “appetites” to food — it involves all things that we want. We want to “feed” the self, based on the whims of the moment. Only a few, according to Plato, let themselves be guided by their perception of the truth. We put our focus here. Since only a few had the intellect and the will to escape the material and physical and be guided by ultimate truth, democracy was a foolish path to disaster. Plato uses a few important analgies to help make his point. A ship at sea, for example, does not take advice on how to sail from the crew. Why then, should the state take advice from the majority, who are guided by their appetites. The state needed guidance from ‘philosopher kings’ who had the ability of true perception. This sounds harsh, but wise decisions benefit all. We think we would be happier following our whims, but in reality, we would be better off as a part of a well-run state, at least according to Plato. Many things, however, stood in the way of achieving this, among them the institution of the family, which only serves to perpetuate ignorance. All kinds of culture and context needed swept away to achieve this ideal state. Of course this ‘context in creation’ had no value anyway because creation itself led us into error. There is much good and bad to say about Plato. Plato put great emphasis on seeking ultimate, eternal, and absolute truth. He believed that the state needed this fixed guidance, and that leaders needed a firm and clear vision of what they wanted to achieve in society. Plato’s lack of respect for creation led him to treat individuals as cogs in the machine of the state. Very few have rights, freedoms, or choices in Plato’s ideal Republic. Plato’s extreme emphasis on the intellect meant that music, poetry, and other such things had to be removed as, in Plato’s view, they obscured rather than revealed the truth. The same holds for the emotions. For Christians, Plato’s gnostic influence led to the introduction of a variety of Christian heresies denigrating creation and the Incarnation. I hope the students saw the importance of the issues Rosen raised, among them. . .
How ‘private’ are public spaces? We understand that when we walk down the street, someone could look at us and observe us, and this does not violate our privacy. What if a person filmed us walking down the street, uploaded it on YouTube set to a techno song. Would that violate our privacy? Most of us are probably fine with surveillance cameras in stores. Perhaps fewer or us (I’m guessing) are alright with traffic cameras at dangerous intersections. Would we be comfortable with cameras monitoring dangerous neighborhoods? The 4th Amendment prohibits government from violating our privacy. Now, however, digital cameras and other such technology are readily available to the public, or at least private companies. Does the 4th Amendment protect us from Facebook violating our privacy? Or what about Google and its roving band of cameras? 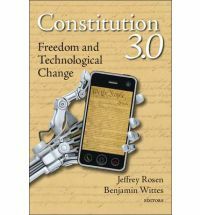 Can private entities violate the 4th Amendment? Do we need to add an such protection into the Constitution? Next we will look at Aristotle, a pupil of Plato’s. While in some ways his vision is complimentary to Plato’s, for the most part he takes an entirely different approach to truth, human nature, and government, and I will update you on him next week. I have written before that I think the best historians are always part-time philosophers and theologians. For events to have meaning, they can’t just “be,” they need a context. If we have no interpretive framework, we have no meaning. 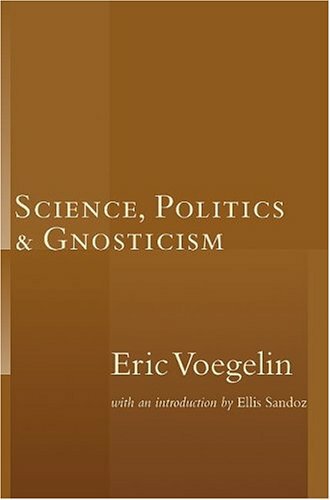 Eric Voegelin may not be a historian by some definitions, but he certainly qualifies as a philosopher/theologian. His short pamphlet Science, Politics, and Gnosticism gives the reader a lot to digest, and provides a framework for understanding modern political movements. Every political philosopher must decide what to do with creation. Should we seek to accommodate ourselves to it, have dominion over it, or seek to transcend or abolish it altogether? While these choices may not always come directly from our conscious selves, we make these choices in one way or another. Voegelin shows that even so-called “materialistic” ideologies like Marxism and Nazism have strong gnostic roots. On the surface at least, Marxism appears to be all about this world. It has a “materialistic” cause for the changes in history (economics and class struggle). It argues for an abolition of traditional religion. It seems to preach an earthly utopia of sorts. Nazism also focused on racial purity. Hitler wanted a 1000 year Reich on earth. He wanted to transform the world politically and aesthetically. But Voegelin helps us look behind the mask. When you inquire about the nature of creation and man, you abstract nature and man. Give up your abstraction and you will give up your questions along with it. For socialist man, [such a question] becomes a practical impossibility. Thus, in denying the right to questions, the supposedly scientific basis of Marxism breaks down. Gnosticism had appeal mainly to the intellectual elite of late antiquity, possibly because it told the elite what they wanted to hear. “This knowledge is not available to all, or easy to see or understand. How clever of you to have found it!” Gnostic religions create a distance between the elite and the rest of humanity, with the “knowledgeable” able to dictate to the rest of us. However much Marx may have hoped for a people’s dictatorship, the movement never got past the party-elite enjoying privileges they specifically denied the people themselves. If Voegelin is right, communists movements never could have advanced beyond this because of their essential gnostic roots. For Nazism (Communism and Nazism formed the immediate context of Voegelin’s writing in the early 1950’s) some of the same truths emerge. They claimed a “scientific” basis for much of their theories involving race. But in the end their totalitarian society naturally denied individual freedoms, but also desired escape from creation through death. Whether through Hitler’s obsession with Wagner, the killing-squads of the SS, or blitzkrieg, itself, I think more than enough evidence exists to see the Nazi hatred for creation. For them redemption can only come via escape from creation. Nazism and Communism as mass movements have disappeared from the scene but Voegelin’s insights show that ancient heresies often get extra lives beyond their immediate contexts. One of the common pitfalls of adolescence is the idea that if you like something, everyone must like it. Conversely, if you don’t happen to like something, it must be unworthy of being liked by anyone. * Who cares if the artist/the work has a great reputation? They must have earned it because people in the past had bad taste. Too bad you/I wasn’t there at the time to set things right and prevent a great injustice. I remember at 16 arguing with my friend over the superiority of Rush (my choice) to Depeche Mode. Looking back I can see how the discussion might have been enjoyable in theory, but at 16 proved only frustrating. I think he argued that Rush stank because you couldn’t dance to their music (very true, with rare exceptions). I shot back that Depeche Mode had zero value because they never had any chord changes in their songs, which is very obviously false (I think I meant to argue “key changes,” but that also must be false). In retrospect then, I must cede victory to him for at least stating something mostly correct. Perhaps the large wings turned me against him. 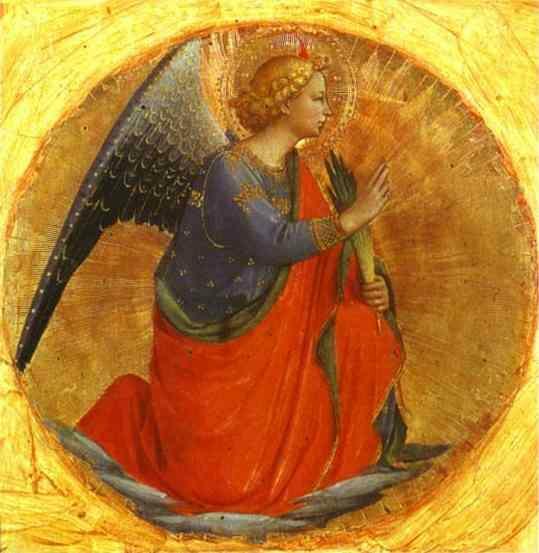 Angels, beings who inspire fear every time (I think) in Scripture, seemed flat and contrived in his work. Those who admired him must be wrong, perhaps succumbing to an unhealthy desire for sentimentality. Now of course it’s fine not to like things, but then to think that others who like them must be inferior to you is nothing less than arrogant stupidity. Again, however, such attitudes are quite common among adolescents, and we must go gingerly on them. Those in the Renaissance would have said that the average teenager has too much heat and moisture in their bodies to listen to the cooler voice of reason. 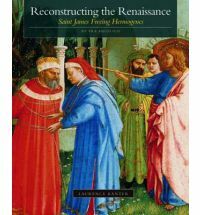 I shudder to think back on my judgmental attitudes, and can give thanks for coming across Reconstructing the Renaissance, a book largely about giving Fra Angelico (literally, Brother Angelico — he was a monk) a rightful place among Renaissance masters. To call this post a “Book Review” will stretch your credulity, for the text of the book itself meant little to me, and much I could not really understand. The author takes up his pen largely (so it seems) to argue for the authenticity of some paintings, and the proper chronology of some of the works. 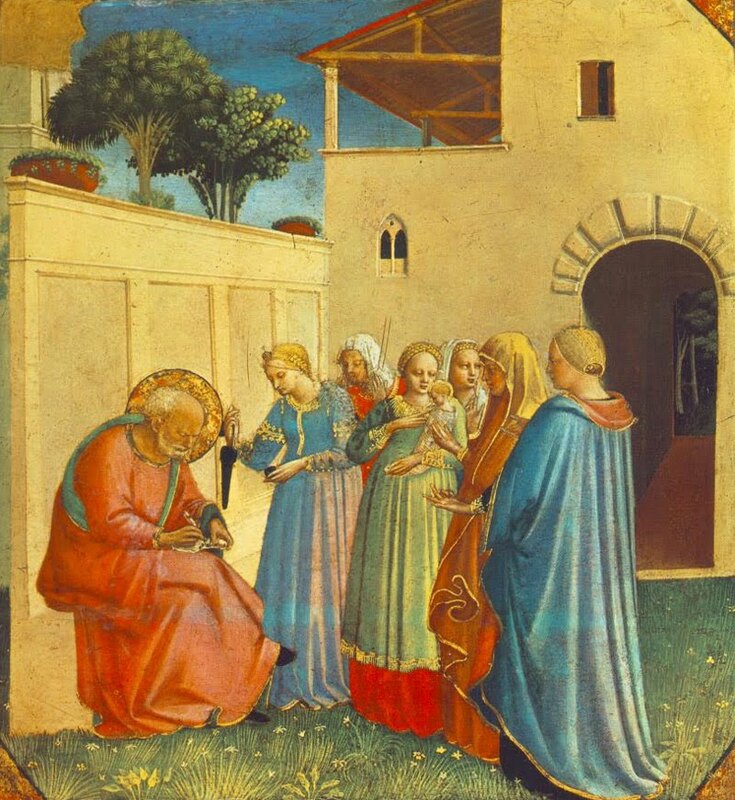 This latter point may seem silly, but I suppose that a proper chronology would ensure something of Angelico’s proper influence upon later painters. 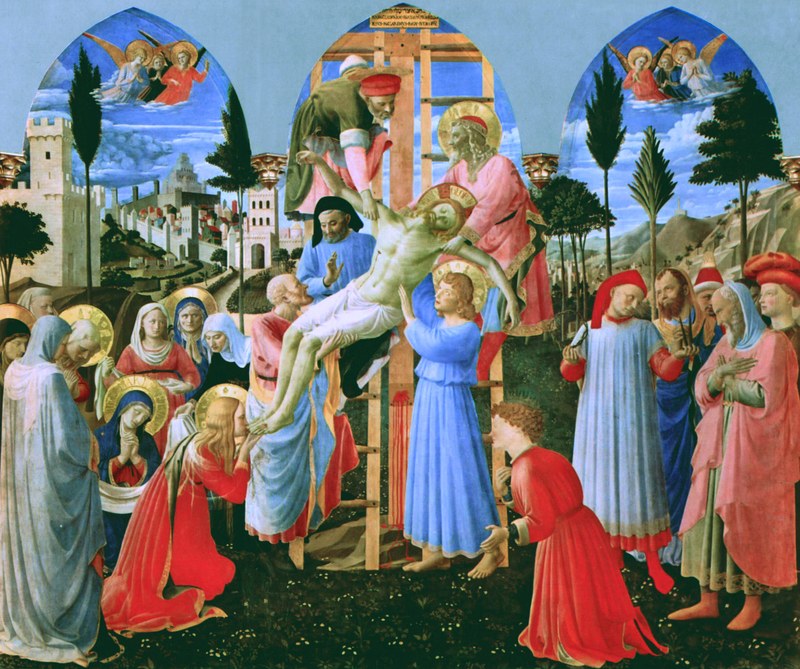 What really grabbed me, however, were the wonderful, high quality pictures throughout the book that allowed Angelico’s great gifts to shine forth. Unfortunately web images cannot do justice to the wonderful presentation of the paintings found in the book. High quality paper and vivid background color make looking at the numerous included works a real delight. Below are some of my favorites. 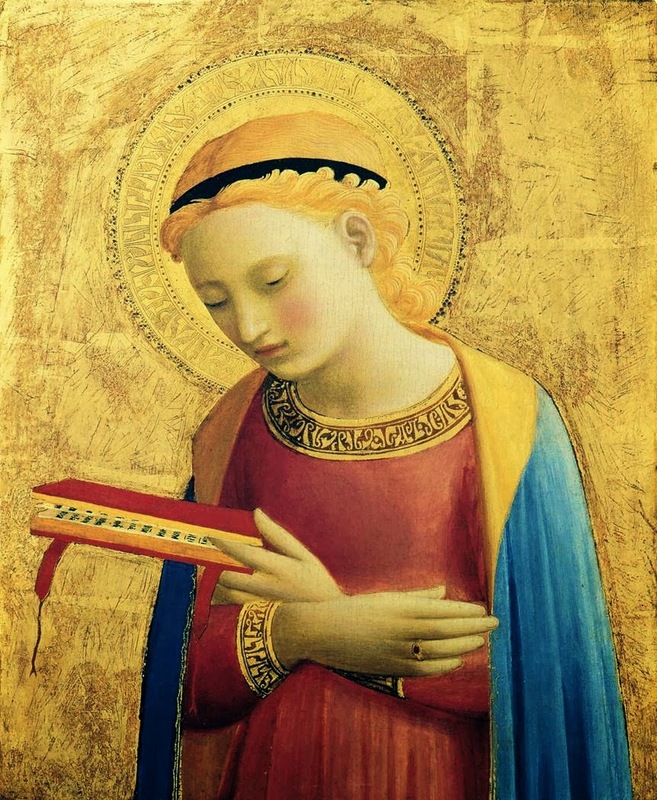 . .
Angelico’s work consistently uses color magnificently, and his subjects always have a serene dignity that no doubt the artist himself possessed. One enters a different place in his world. One wishes for the peace his subjects have. 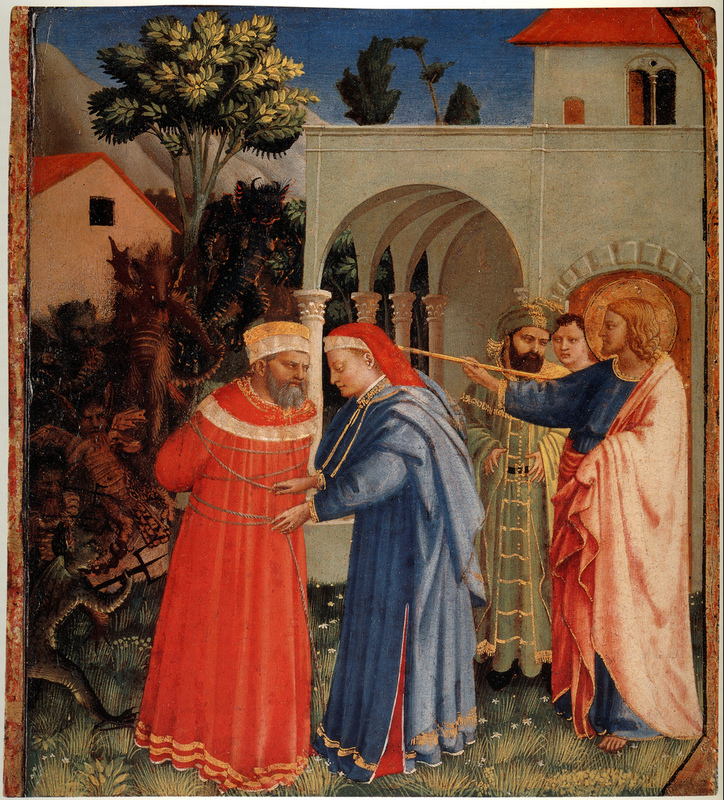 The title of the book comes from a painting of St. James freeing Hermogenes, who earlier had persecuted the apostle. Again, his same qualities shine through, though lest anyone think Angelico could paint only “pretty” things, the devils in the background show his versatility. I do not recommend this book to read, though I I do think that if you can find it cheap (as I did at a used book store) do go ahead and take the plunge. Look at the pictures and feel all the stormy “heat” of adolescence melting away. I will leave it lying around my house, in hopes that he and my other children might pick it up one day. Perhaps then, they may avert the follies of their father’s youth. *Some adults appear to go in the opposite direction by claiming that nothing has objective value, in apparent rejection of the foolishness of youth. I say “appears” because I think a lot of similarity exists between the overcommitted teen and cynical adult. Both reduce everything to their own personal point of view, a purely subjective standard. Last week we looked at Henry II and his challenge to the independence of the Church, and to feudal order in general. A generation later, Frederick II (1194-1250) mounted a similar, somewhat more successful assault on the Church. The mighty Pope Innocent III opposed him, but in this instance, Frederick prevailed for the most part. This fact in itself posed a threat to the Church’s vision for Europe. 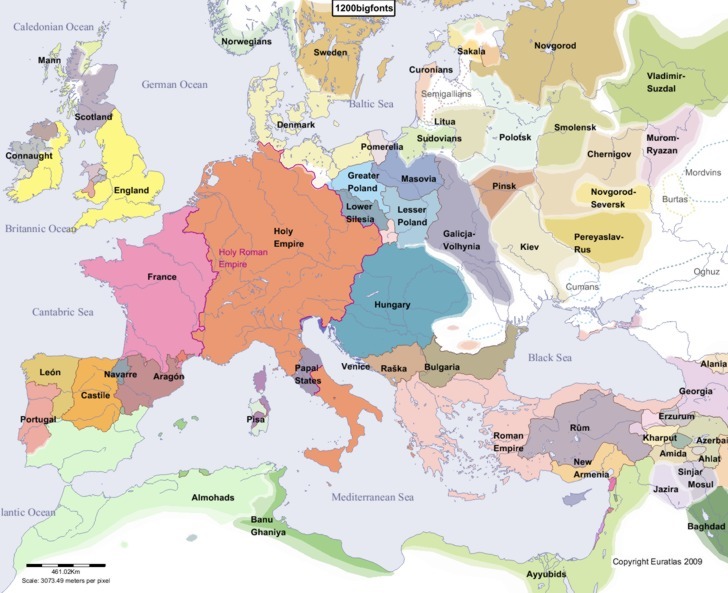 The Church wanted to create a Christian community in Europe where people’s primary identity would be “Christian,” and not “English,” or “French.” Concentration of power might mean that a ruler could challenge that general identity. Too much power might result in more conflict as other states challenged or resisted that power. Frederick’s vast holdings by definition challenged the Church’s concept of Europe, but also the feudal concept of everyone sticking to their own ‘sphere’ of influence. Quite simply, he had too many slices of the pie to himself. Some called Frederick, “The Wonder of the World.” He imported animals from exotic places and created the first zoo in Europe. He wrote the standard manual for the sport of hawking, a medieval sport that required a great deal of patience and careful observation. He spoke many languages, even Arabic, and often conversed with Moslem scholars. Others called him, “The Anti-Christ.” He founded the first university in Europe that was distinctly secular in nature. Various popes consistently opposed him, and eventually Frederick struck back, murdering 120 bishops en route to a church council Frederick believed would rule against him. Pope Innocent IV declared war on Frederick. When some of Frederick’s subjects rebelled, Frederick turned ruthless, putting captured rebels in burlap sacks with poisonous snakes, and throwing them into the river. The Pope eventually called off the war against him, though Frederick died shortly after and so could not savor the fruits of his ‘victory.’ Frederick’s reign reveals that the Medieval synthesis had cracks, cracks that would widen into the next century. By choosing to oppose Frederick, the Church had to wade even further into politics than they usually did. They spent a lot of their moral capital doing this, and failed in the attempt. In the next few weeks we will see the ripple effects of this as the Church’s hold over society weakened. The “successful” challenge of Frederick did not just have to do with Frederick, but with the Church’s own actions at the time. In all ages the Church must decide the extent to which it should enter the political arena in order to try and achieve some common good. If you accept Augustine’s interpretation of the world as “The City of Man,” this always involves risk. What can or should be done in order to influence “the good” in a purely political sense? For example, in Frederick’s youth his relatives Otto and Philip fought a civil war over the power inherent in his throne. Pope Innocent III waded into the controversy, wanting to obtain the best possible advantage he could for the Church and the territorial integrity of the Papal States. He initially supported Otto, who pledged not to extend his power into Sicily should he win. But when the war’s events showed that Otto would lose, Innocent III switched his allegiance to Philip, hoping at the last moment to salvage something. But then Philip died, leaving Otto the winner by default. Innocent III switched his allegiance again back to Otto, whereby Otto reneged on his original deal and marched his armies into Sicily after all while Innocent stood by helpless. I think Innocent III had good intentions, but the proof is in the pudding — he was way out of his league, and the prestige of the Church suffered. It appeared to be one political faction among many, and a losing one at that. Next week we will have some fun with medieval medicine. Each of the years this game has been played I have seen slightly different outcomes each time. A usual pattern, however, has Athens try and keep a tight leash on Chios to prevent them from rebelling (which Chios, if it wants to win big, must do). Persia usually wants to sponsor Chian independence and use their military for themselves. Thus, Athens becomes Persia’s clear enemy. This year Persia ended up as probably the biggest winner, with Chios and Corinth scoring victories as well, albeit lesser ones. Both Athens and Sparta ended up destroyed. In our debrief of our game, we touched on a few key concepts. . . I admitted to the class that Athens has the hardest job of any of the combatants. At the start of the game no one likes them and their ally has a strong incentive to rebel. With all of the power and money, they are vulnerable. The only way Athens can win big is through ruthlessness. If they wish to ‘guarantee’ survival, their only other option is “repentance” and generosity right from the start. Most Athenian teams don’t realize this at the start of the game, however, and initially pursued a “strong” course of action. Then later they attempted to be nice to their ally, but by then it was too late. A middle course of action usually ends up in defeat for Athens. Sparta too had the dilemma of how to utilize its ally. In the end they trusted them too much and paid for it dearly. How one can deal with allies that don’t like you is something we discussed, and something that faces us know in the mid-east. The outcome of our own war-game resembled the actual war in a variety of ways. Though Sparta won the actual conflict, their victory doomed them to eventual defeat as the war both exhausted them and stretched them too thin in victory. 1. Fringe opinions are generally bad, but inevitable if you want to have a democracy. 2. Fringe opinions are not bad or good because they have no impact. The vast meat-grinder that is American society softens whatever fringe opinion comes along before it goes mainstream. 3. Fringe opinions are bad, because those who hold then generally are not open to debate, dialogue, and compromise, all of which are essential to a democracy. 4. Radical fringes usually harm no one but a select few and pose no real threat normally. But in times of great national stress or emergency, they become much more dangerous, as their appeal grows exponentially. We also discussed what we meant by “fringe opinion.” Is what makes an opinion “radical” the idea itself, or the number of people who espouse it? Can the majority hold a “fringe” opinion? Should any safeguards be taken against fringe opinions? Many European nations ban the Nazi party, for example, but not the United States. Obviously we do not face a civil war to the death in our midst, and are nowhere close to the polarization Greece experienced during the Peloponnesian War. But do have any reason for concern? 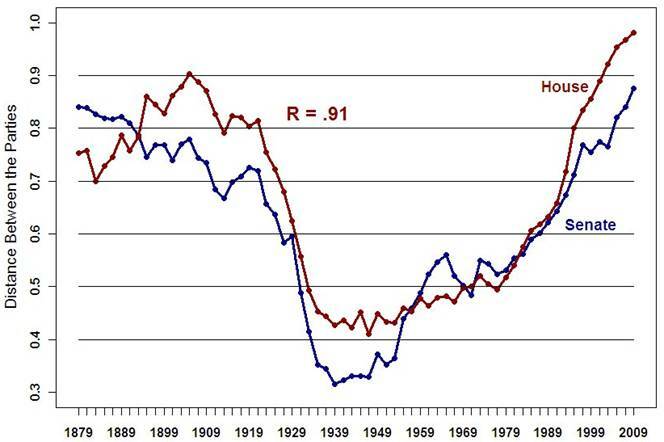 These graphs might give us pause. 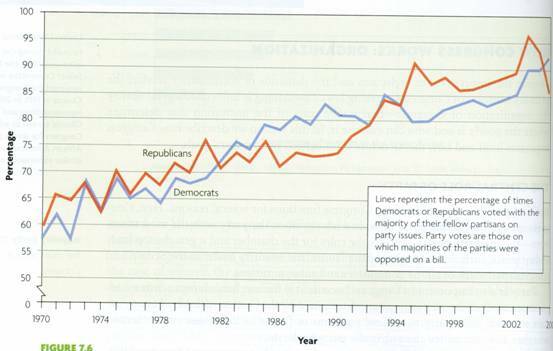 The first shows the increase of straight party voting over the years, that is, the increase of Democrats only voting with Democrats and Republicans with Republicans. The second shows the ideological distance between the parties. 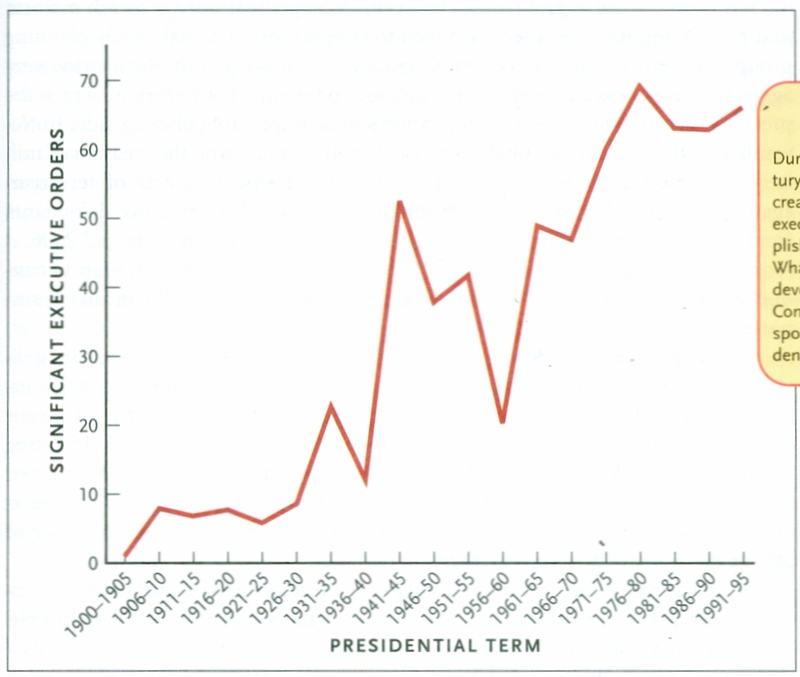 . .
And finally, the rise of presidential Executive Orders. If Congress stops working the rise of executive power seems inevitable. . .
For not long afterwards nearly the whole Hellenic world was in commotion; in every city the chiefs of the democracy and of the oligarchy were struggling, the one to bring in the Athenians, the other the Spartans. Now in time of peace, men would have had no excuse for introducing either, and no desire to do so; but, when they were at war, the introduction of a foreign alliance on one side or the other to the hurt of their enemies and the advantage of themselves was easily effected by the dissatisfied party. 71 And revolution brought upon the cities of Greece many terrible calamities, such as have been and always will be while human nature remains the same, but which are more or less aggravated and differ in character with every new combination of circumstances. In peace and prosperity both states and individuals are actuated by higher motives, because they do not fall under the dominion of imperious necessities; but war, which takes away the comfortable provision of daily life, is a hard master and tends to assimilate men’s characters to their conditions. When troubles had once begun in the cities, those who followed carried the revolutionary spirit further and further, and determined to outdo the report of all who had preceded them by the ingenuity of their enterprises and the atrocity of their revenges. The meaning of words had no longer the same relation to things, but was changed by them as they thought proper. Reckless daring was held to be loyal courage; prudent delay was the excuse of a coward; moderation was the disguise of unmanly weakness; to know everything was to do nothing. Frantic energy was the true quality of a man. A conspirator who wanted to be safe was a recreant in disguise. The lover of violence was always trusted, and his opponent suspected. He who succeeded in a plot was deemed knowing, but a still greater master in craft was he who detected one. On the other hand, he who plotted from the first to have nothing to do with plots was a breaker up of parties and a poltroon who was afraid of the enemy. In a word, he who could outstrip another in a bad action was applauded, and so was he who encouraged to evil one who had no idea of it. The tie of party was stronger than the tie of blood, because a partisan was more ready to dare without asking why. (For party associations are not based upon any established law, nor do they seek the public good; they are formed in defiance of the laws and from self-interest.) The seal of good faith was not divine law, but fellowship in crime. If an enemy when he was in the ascendant offered fair words, the opposite party received them not in a generous spirit, but by a jealous watchfulness of his actions.72 Revenge was dearer than self-preservation. Any agreements sworn to by either party, when they could do nothing else, were binding as long as both were powerless. But he who on a favourable opportunity first took courage, and struck at his enemy when he saw him off his guard, had greater pleasure in a perfidious than he would have had in an open act of revenge; he congratulated himself that he had taken the safer course, and also that he had overreached his enemy and gained the prize of superior ability. In general the dishonest more easily gain credit for cleverness than the simple for goodness; men take a pride in the one, but are ashamed of the other. The cause of all these evils was the love of power, originating in avarice and ambition, and the party-spirit which is engendered by them when men are fairly embarked in a contest. For the leaders on either side used specious names, the one party professing to uphold the constitutional equality of the many, the other the wisdom of an aristocracy, while they made the public interests, to which in name they were devoted, in reality their prize. Striving in every way to overcome each other, they committed the most monstrous crimes; yet even these were surpassed by the magnitude of their revenges which they pursued to the very utmost,73 neither party observing any definite limits either of justice or public expediency, but both alike making the caprice of the moment their law. Either by the help of an unrighteous sentence, or grasping power with the strong hand, they were eager to satiate the impatience of party-spirit. Neither faction cared for religion; but any fair pretence which succeeded in effecting some odious purpose was greatly lauded. And the citizens who were of neither party fell a prey to both; either they were disliked because they held aloof, or men were jealous of their surviving. Thus revolution gave birth to every form of wickedness in Greece. The simplicity which is so large an element in a noble nature was laughed to scorn and disappeared. An attitude of perfidious antagonism everywhere prevailed; for there was no word binding enough, nor oath terrible enough to reconcile enemies. Each man was strong only in the conviction that nothing was secure; he must look to his own safety, and could not afford to trust others. Inferior intellects generally succeeded best. For, aware of their own deficiencies, and fearing the capacity of their opponents, for whom they were no match in powers of speech, and whose subtle wits were likely to anticipate them in contriving evil, they struck boldly and at once. But the cleverer sort, presuming in their arrogance that they would be aware in time, and disdaining to act when they could think, were taken off their guard and easily destroyed. Now in Corcyra most of these deeds were perpetrated, and for the first time. There was every crime which men could commit in revenge who had been governed not wisely, but tyrannically, and now had the oppressor at their mercy. There were the dishonest designs of others who were longing to be relieved from their habitual poverty, and were naturally animated by a passionate desire for their neighbour’s goods; and there were crimes of another class which men commit, not from covetousness, but from the enmity which equals foster towards one another until they are carried away by their blind rage into the extremes of pitiless cruelty. At such a time the life of the city was all in disorder, and human nature, which is always ready to transgress the laws, having now trampled them underfoot, delighted to show that her passions were ungovernable, that she was stronger than justice, and the enemy of everything above her. If malignity had not exercised a fatal power, how could any one have preferred revenge to piety, and gain to innocence? But, when men are retaliating upon others, they are reckless of the future, and do not hesitate to annul those common laws of humanity to which every individual trusts for his own hope of deliverance should he ever be overtaken by calamity; they forget that in their own hour of need they will look for them in vain.